GRANT, Ulysses S. (1822-1885) was an American soldier and statesman who served as Commanding General of the Army and the 18th President of the United States, the highest positions in the military and the government of the United States. A prominent United States Army general during the American Civil War, Grant led the Union Army to victory over the Confederacy with the supervision of Abraham Lincoln. As President of the United States (1869–77) Grant led the Republicans in their efforts to remove the vestiges of Confederate nationalism and slavery during Reconstruction. Partly-printed Document Signed “U.S. Grant” as President of the United States, 1pp. 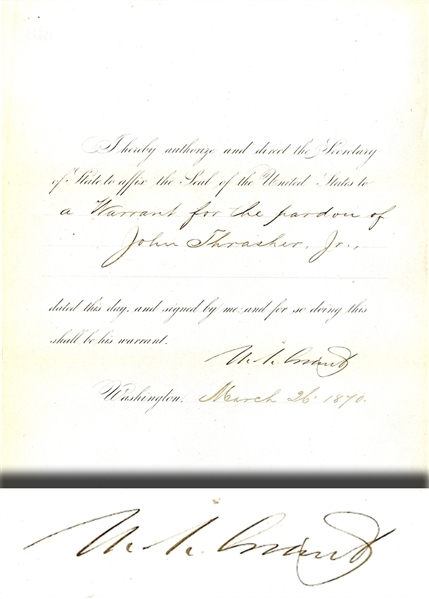 quarto, March 26, 1870, directing the Secretary of State to affix the Seal of the United States to a Warrant for the pardon of John Thrasher, Jr.” Fine condition.